Who sees the hidden young carers? 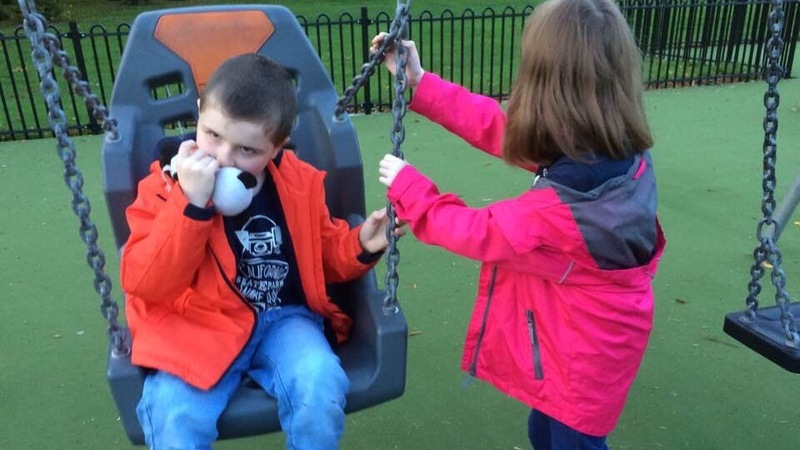 As her brother climbed awkwardly into the swing she held it still for him as best she could before gripping the chain and gently pushing it forwards and backwards to keep him happy. For all her brother screams and attacks her and makes her life challenging she never stops wanting to help him and support him. She pushed that swing with all her might (he is 21 pounds heavier than she is) until he tired of it and wanted off. The only one who noticed was me. This is just one example of young children who are living their lives as young carers hidden from the eyes of so many around them. Who sees the hidden young carers like my daughter? Just days before her brother was having a difficult night. He has complex medical and developmental needs and is unable to communicate using speech. He was distressed and agitated and it was taking both myself and my husband to keep him safe and calm. He had just had a difficult meltdown where things had been thrown and broken and as he gradually calmed we were sorting out the mess and chaos surrounding him. As one of us cleaned up broken glass the other went to check on food that had been quickly left cooking downstairs. On my return I could not find my son in his room and neither could I find my daughter. I stood for a minute when I heard a noise I had not heard for days: children laughing! His sister had decided to run her brother a bath to cheer him up. She had made sure the water was the right temperature and put in his favourite toys and here she was sitting on the toilet beside him checking he was safe like she was suddenly ten years older than her true years. The only one who knew she had done that was me. Who sees the hidden young carers like my 8 year old daughter? I was so glad no-one else saw her and I know she won’t do that again. But it still leaves the question who sees the hidden young carers like her? There are young carers groups out there. They do a wonderful job for many young carers. Yet there remains so many young carers like my daughter who are ‘hidden’ due to a number of reasons. My daughter is not recognised as a young carer because we are a two parent family and it is deemed her level of care for her brother is not ‘substantial’ or regular enough. She is not recognised as a carer because she herself has some needs and it is deemed that due to these needs she is not able to care for her brother. Until recently she was not considered to be old enough to be a young carer. It was felt by professionals that we should not allow her to take on the caring role that she herself has readily and willingly taken on. These are just a few reasons why young carers can be ‘hidden’. Statistics say there are around 700,000 young carers in the U.K. That’s the ones who qualify as young carers but what about all the other precious children who are doing more than they should for a disabled or ill family member and no-one sees or knows? I see my daughter so at least I can be there to support her and thank her even if others don’t. There are 13.3 million disabled people in the UK. I wonder how many of them are being cared for today by a hidden young carer?